Modern technologies of sunflower harvest allow cropping output yield with high quality under any weather conditions, minimizing possible losses and procuring the high speed for cultivating sown land. During harvesting, the average loss rate for harvesters is about 3 centers per 1 hectare. The most valuable are cut and uncut heads, which are still entire after harvest, and the seeds, which didn’t get in combine separator. Direct losses may be caused by a decrease of crop due to late harvest and seeds falling off. yield of vegetable oil from 1 hectare significantly increases, the productivity of the harvest equipment elevates. Usage of desiccants is safe for human health, environment, and doesn’t influence composition of the soil and its further exploitation. 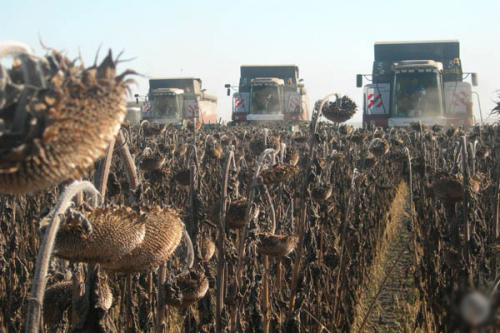 Harvesting of sunflower is carried out by combines equipped with mechanisms for crushing of stalks of plants, leaving them on the processed field. Stalks which weren’t cut off together with a root is crushed by harrows subsequently. Headers for collecting sunflowers are actively used in all regions of cultivation. Headers cope with any methods of planting crops and under any weather conditions, at the same time. Correctly chosen time for a harvest season, usage of modern agricultural machinery and usage of agrarian technologies for acceleration of maturing of seeds promote the maximum results of harvesting and production of sunflower oil.